The final talk of the Water Waves in Industry event was given by Rod Rainey, Head of Technology, Floating Structures Division, at Atkins Oil & Gas, and Jeremy Colman, independent consultant, on predicting wave crest elevations. A key danger for offshore oil rigs, for example in the North Sea, is large crests. Hence oil industry researchers are very interested in the prediction of the largest anticipated wave crest in a given time frame for a given wave field. Hindcasting over the past 60 years when combined with probability theory has been moderately successful but distributions like the Forristall distribution miss rogue waves. In the second part of the talk, Jeremy Colman presented the details of a statistical argument based on the Extremal Types Theorem and a Bayesian method for estimating parameters. 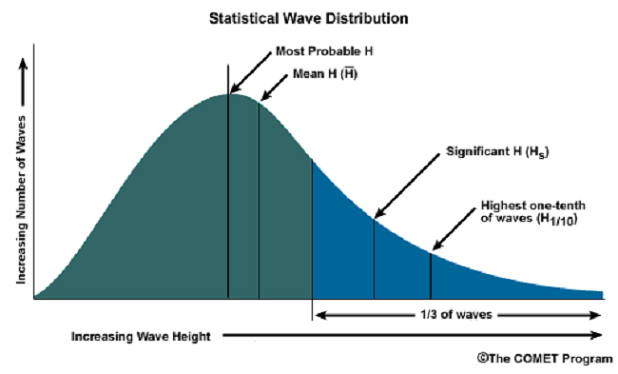 Given appropriate distribution input for the highest significant wave, a probability distribution of wave heights was produced for time spans up to several hundred years. It was mentioned anecdotally, that an excellent place to see steep waves is to take the Dale Princess boat ride out to Skomer Island off the coast of Pembrokeshire in Wales. A video of the talk is available here.